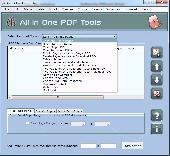 PDF Page Saver software is a simple and affordable extraction tool that facilitates the reuse of PDF files by enabling you to extract pages from PDF files and save them in several different formats. PDF page rearrange software has ability to split PDF files into separate documents, either by page range or page numbers, and merge an unlimited number of PDF documents into a single PDF file. AWinware PDF page replace software provides capability to replace any page of PDF files with another PDF file.